James' original topic title: Question for the boss! has since been edited by Admin. Weighing in at a hefty 100,000 Yen (c.£786)! And it was double the price of all the other uber-alluring ones. However. I've not seen one in the flesh. Is this really the jewel in the crown? Does anyone have one? What the hell is it? Many questions, few answers. Over to you, Paul. The questions have mostly already been answered, at some considerable length - over two years ago, James. 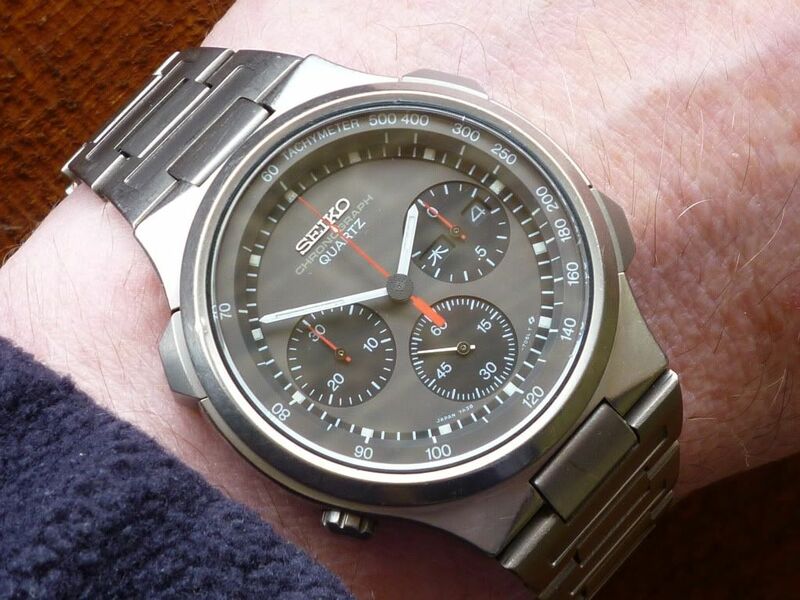 The Rarest And Most Expensive Seiko 7Axx Of Them All ? I guess I need to get cracking on writing up some more of these topics on here, to satisfy our hungry readership. Just to keep the rabble at bay troops happy, here's a couple of wrist shots of my own 7A38-7030 that I've posted in the WRUW thread. It's not exactly a pristine example, but given the rarity of this particular JDM model, I got it for a good price - thanks to José Sotto. To do this topic justice, this time around, we're going to need some input from another collector (besides myself). Someone, who in his day, certainly owned the biggest private collections of both 7A38's and 7T59's in the world. 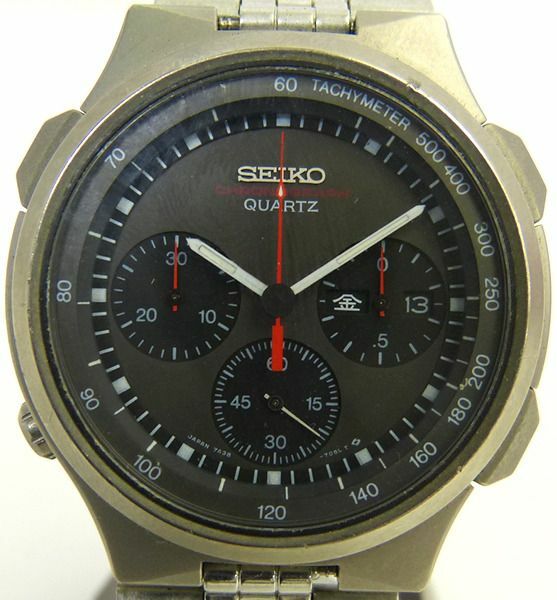 This was the most recent example of a 7A38-7030 to appear on Yahoo Japan in January 2012 (when it was last re-listed on there). As I've already got the three auction photos uploaded to my Photobucket, I presume I must have written about it somewhere already. Needless to say, as I'd suspected at the time, Pete later confirmed to me that he'd bought this one as well. Size: Approx. 40mm diameter (excluding crown and pushers) x 43mm lug to lug x 11.5mm deep - 10mm lug width fixing. The model is easily distinguished by its large square-ended pusher buttons, which measure approx. 8mm x 6mm. 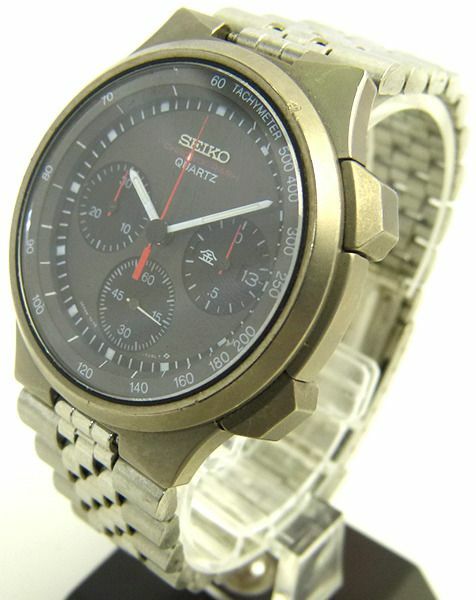 Case material: All Titanium, including case-back - metallic grey anodized finish. 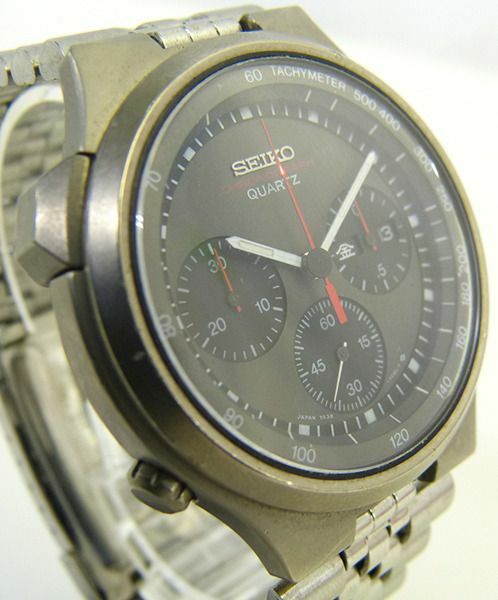 Dial: Part number is 7A38705LXB13. 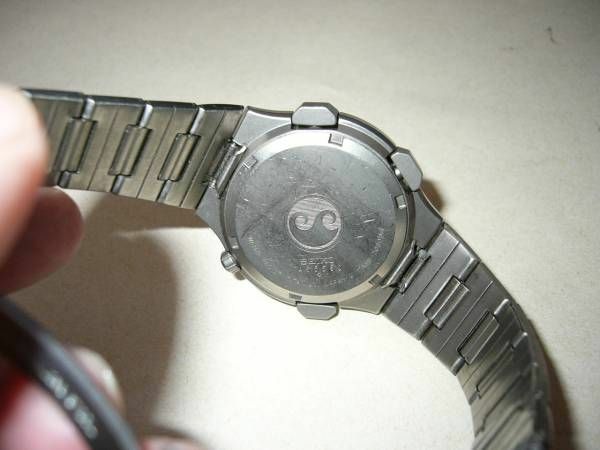 Dial face is grey, with predominantly white printing. Sub-dials are matt black. A matt black dial ring carries the lumed hour batons. 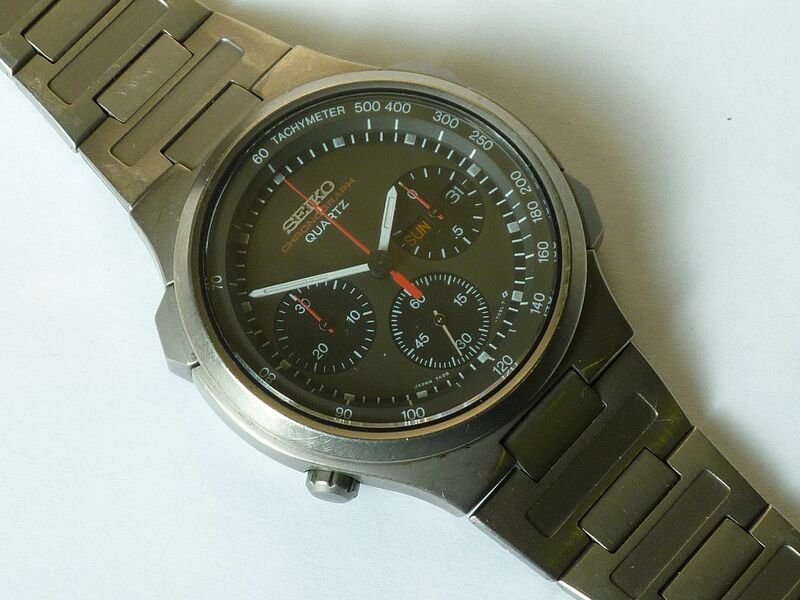 The Tachymeter ring is in two parts, grey (numbers) and matt black (marks). 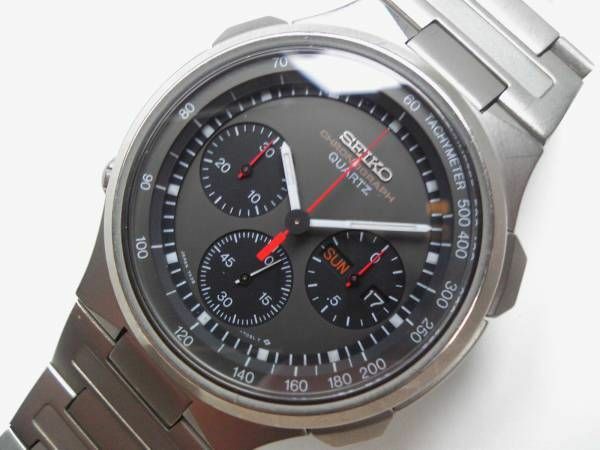 Dial markings: SEIKO (off white raised logo), CHRONOGRAPH QUARTZ; at bottom of dial JAPAN 7A38 705L T Suwa symbol. Day and Date wheels: White lettering on black background. Second languages seen: Japanese Kanji (only) - JDM model. Hands: Hour and Minute hands are White (with lume). 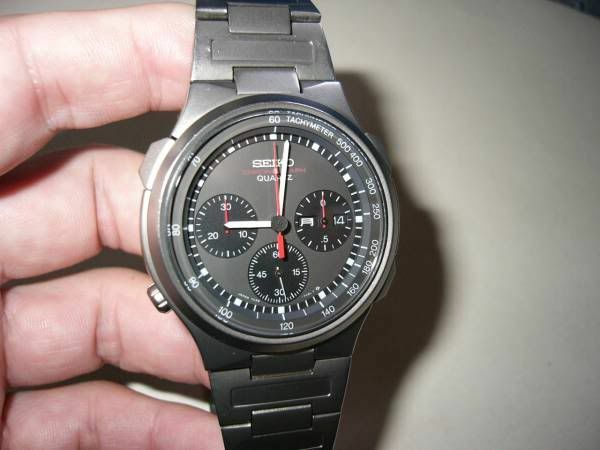 Sweep second hand (large black boss) and upper sub-dial hands are red. 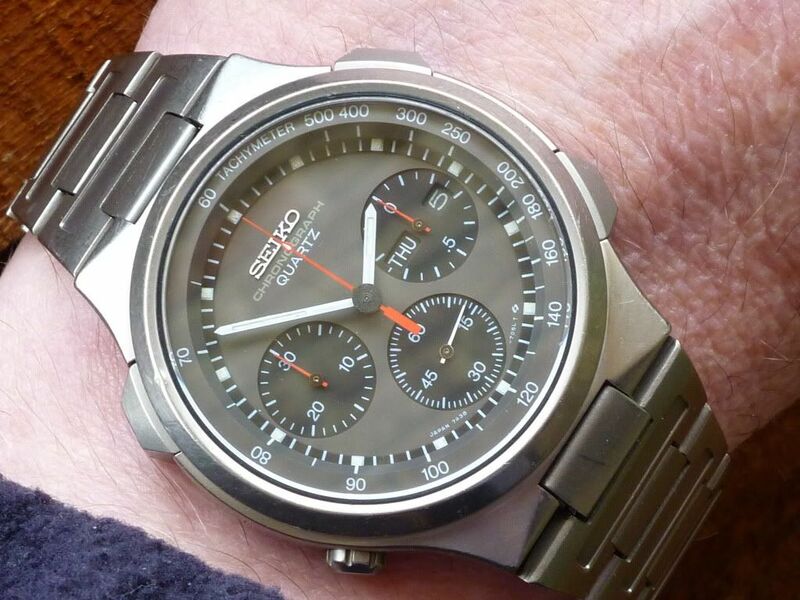 Seiko crystal p/n: 325W22SN00 - 32.5mm Ø x 1.55mm thick, with polished bevel edge - sapphire rather than (Hardlex) mineral glass. 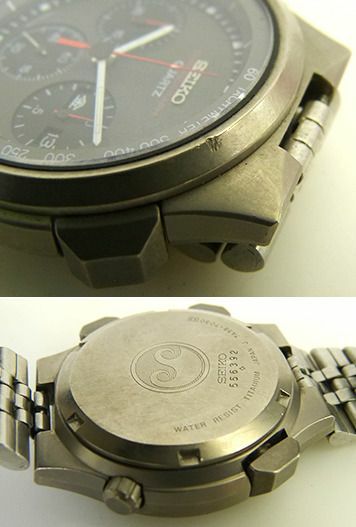 Case-back markings: Double Wave case-back; SEIKO (serial #) SUWA symbol; WATER RESIST TITANIUM JAPAN J 7A38-7030 [A3]. 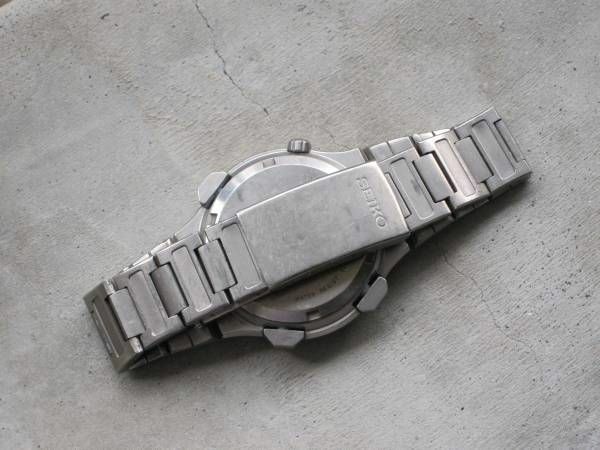 Bracelet: Seiko p/n YA22A. Tapers from 23mm at case to 16mm at clasp. Fixing by 10mm x 1.5mm Ø shouldered spring bars. 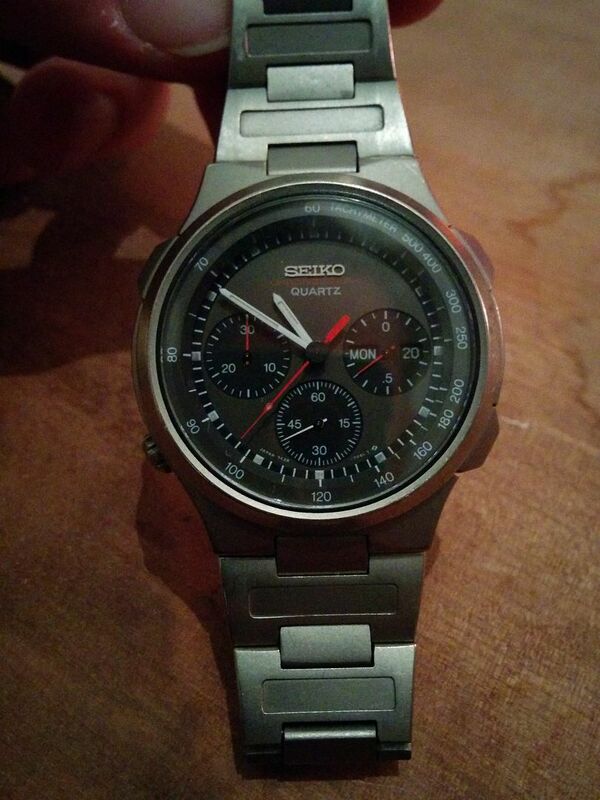 which is stamped SEIKO is unique to this model. 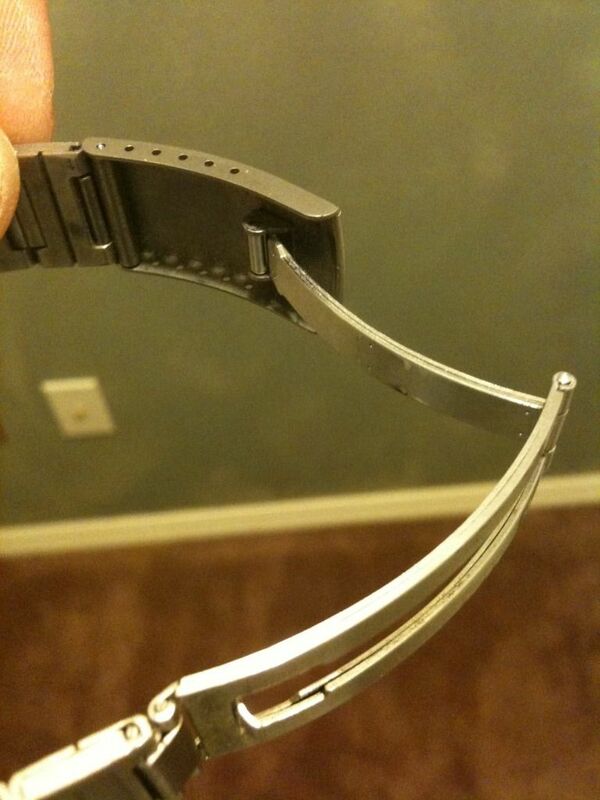 It's connected to the bracelet by a similarly unique stainless steel Z-fold. Production dates: Serial numbers seen range from 3Dxxxx to xxxxxx - December 1983 to T.B.D. Geography: Far East - a Japanese Domestic Market model. 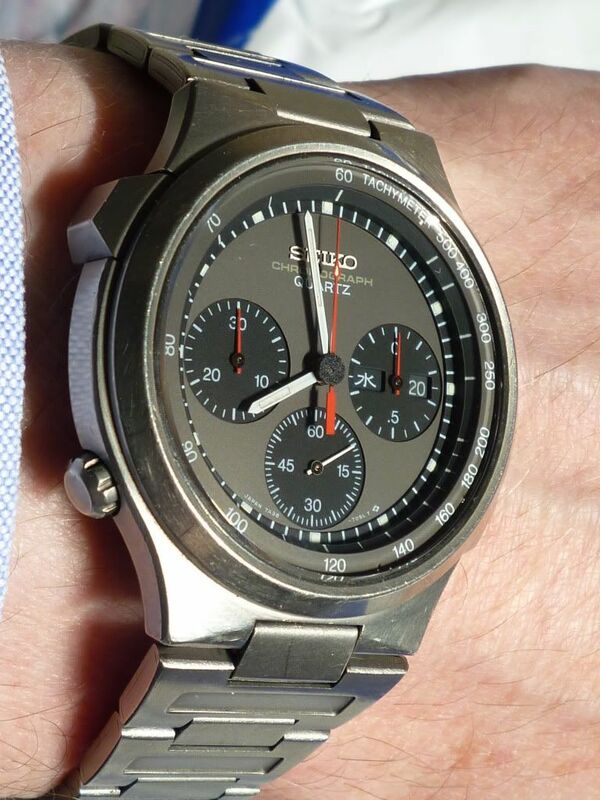 Buyers Tips: Red CHRONOGRAPH dial printing prone to fading - sometimes to a pale cream. 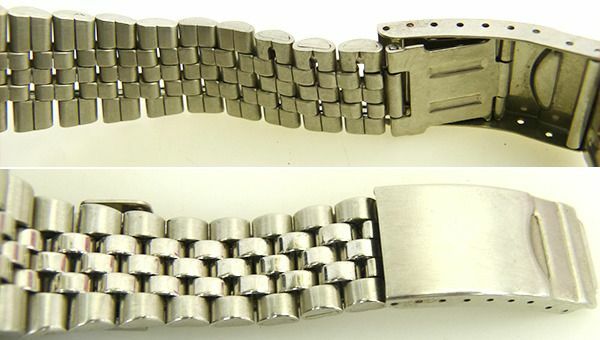 Although Titanium, the p/n YA22A bracelet is just as prone to stretch and breakage as other Seiko stainless steel folded link construction bracelets. 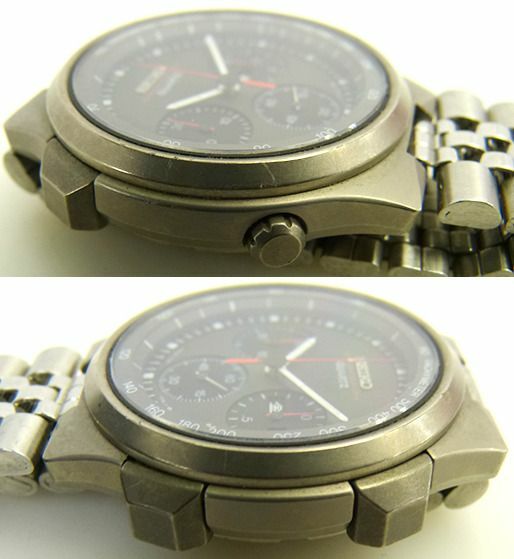 Beware fitment of non-original replacement bracelets, particularly Seiko p/n YB21A, normally found on the later, similar appearing all-Titanium 7T42-7A10. 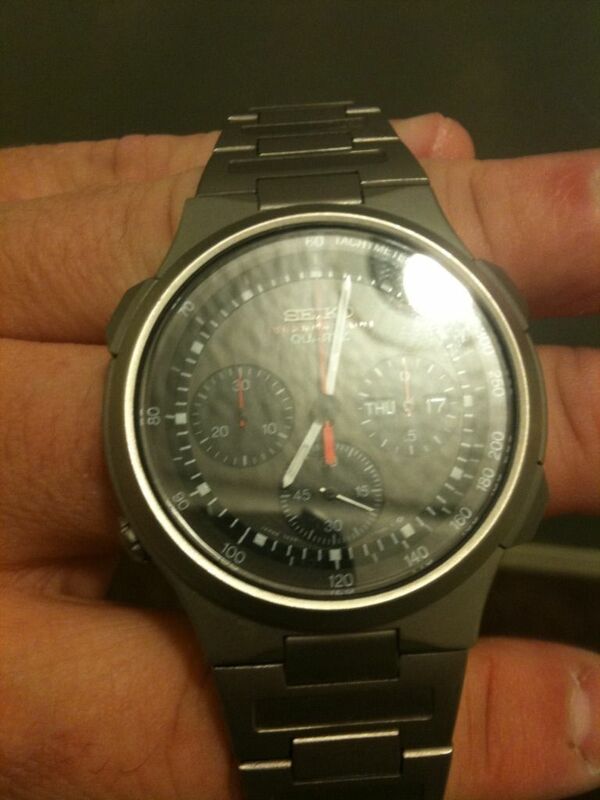 Price Guide: $200 - $1500 dependant upon condition (beater - NOS). Rarity Factor: 3/5 - Hard To Find. Hello. I'm glad I found this site. 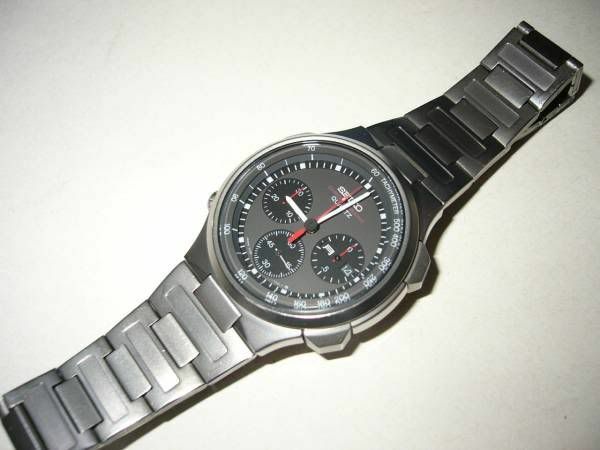 I have been looking for more people in the world who own this watch. I own one of these exact models, all titanium. I'd post a picture of it but I don't know how. All the pictures I have are on my SD card. I'm looking to get it cleaned, checked out (although I have no issues with it) and have all the gaskets replaced. From what I have gathered, the only place to get these services performed is at SCA in New Jersey. Has anyone else shipped a precious and rare watch to SCA? Any issues to report? Thanks in advance and I look forward to reading your response. We try to please, but I will admit I'm well behind in my own self-imposed schedule of writing up these individual 7A38-xxxx topics. So you can thank James for starting this one off, meaning I had to give some kind of a response, even if it was a bit of a 'place-holder'. Not all of them favourable. 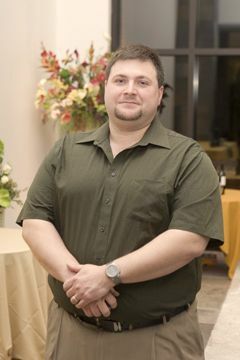 I do mean CoServ. Thanks for the heads up. I certainly didnt' get any warm and fuzzy feeling when I spoke to them on the phone and your comments back that up. 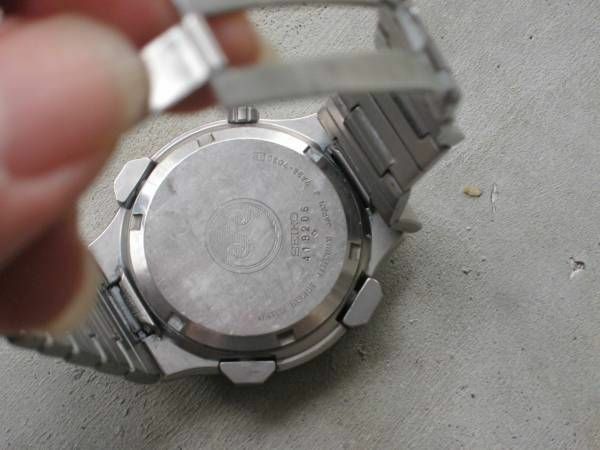 Be that as it may, I have found a local watchmaker willing to take the watch apart for a cleaning and gasket replacment. Now I just need to get all the gaskets. 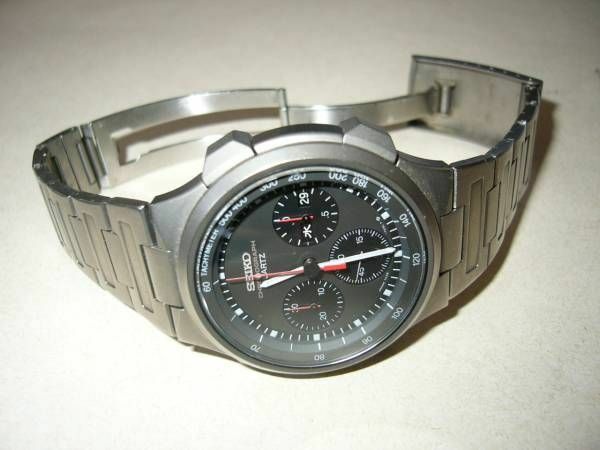 Can anyone suggest any place other than CoServ to purchase the gasket set for this JDM watch here in the states? I'll post the part numbers you'll need later (once I've looked them up). Sorry for the slight delay. 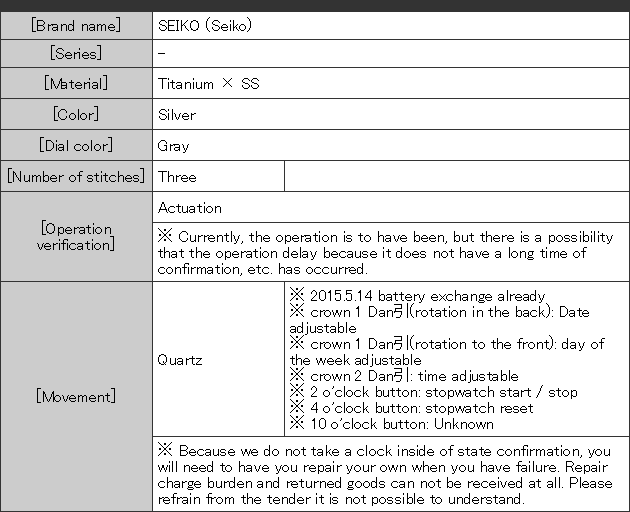 Not all these parts all are listed in Seiko's bills of materials, so I've had to extrapolate. Trust me. Unless he has previous experience of fitting these gaskets, I would recommend leaving them as is - they have VERY tight tolerances. It's been over a year since I've seen a 7A38-7030 listed on Yahoo Japan Auctions. 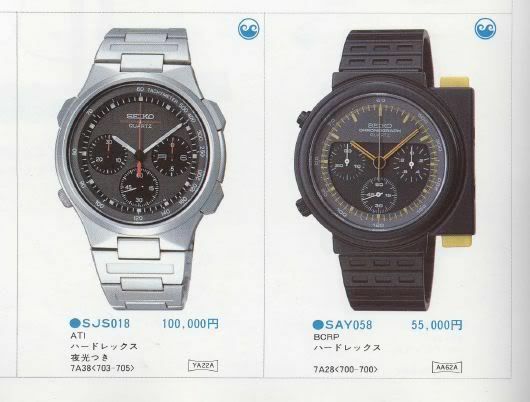 That last one was documented in the January 2012 #1 Auction News article (towards the bottom): http://www.seiko7a38.com/news.htm and also mentioned in my third post in this thread. 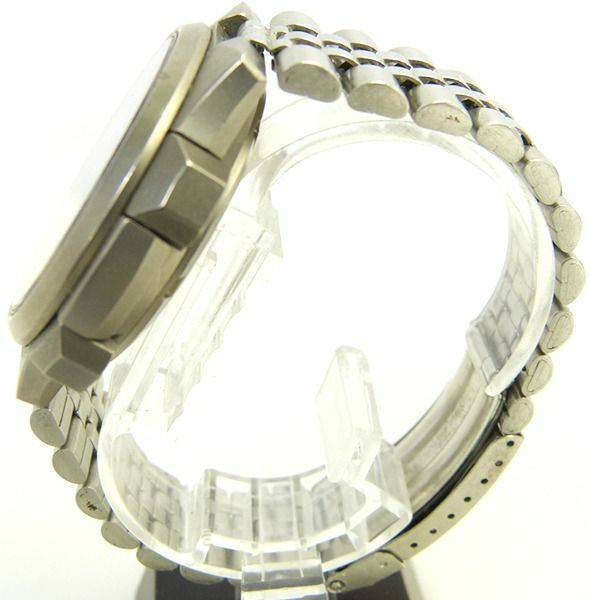 The auction ended on February 18th - at the scheduled local (Japan) time of 9:24pm. There was no extension - the winning bidder placed his high bid at about 9:12pm local time. 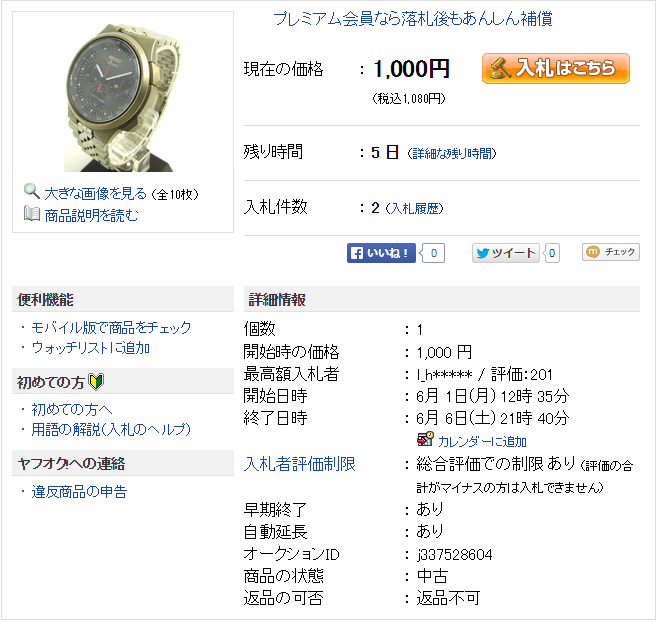 It sold for only 27,000 Yen (equivalent to $287.50 / £185) after 17 bids by 4 bidders. Low for one of these rare all-Titanium JDM models - normally they sell in the 40,000 - 50,000 Yen price range. On the face of it, from the seller's three photos, at least, it appeared quite tidy. 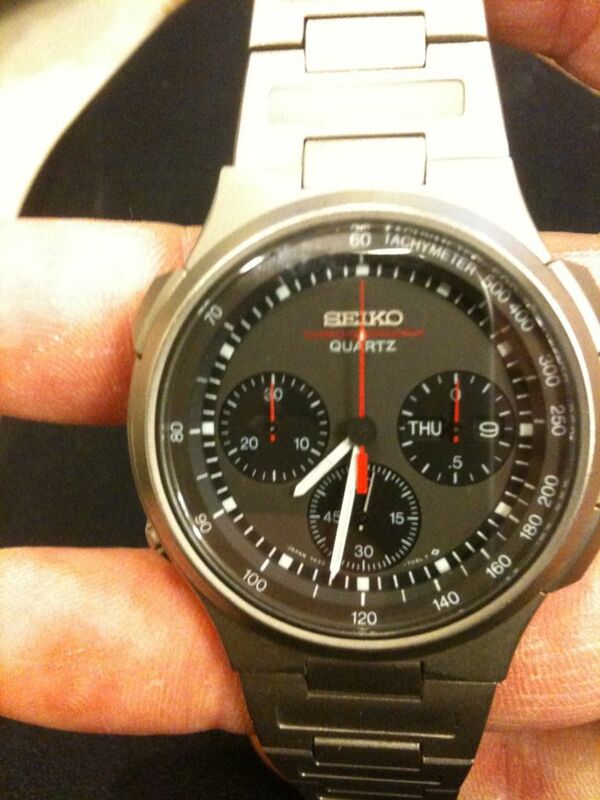 The red CHRONOGRAPH script on the dial was faded (as is quite common). So it would appear that the bracelet was not only short, but that a link connection was broken - unfortunately not shown in any photos. Then again, it might only have needed something a simple as a missing spit pin replaced (used on the removeable adjustment links). 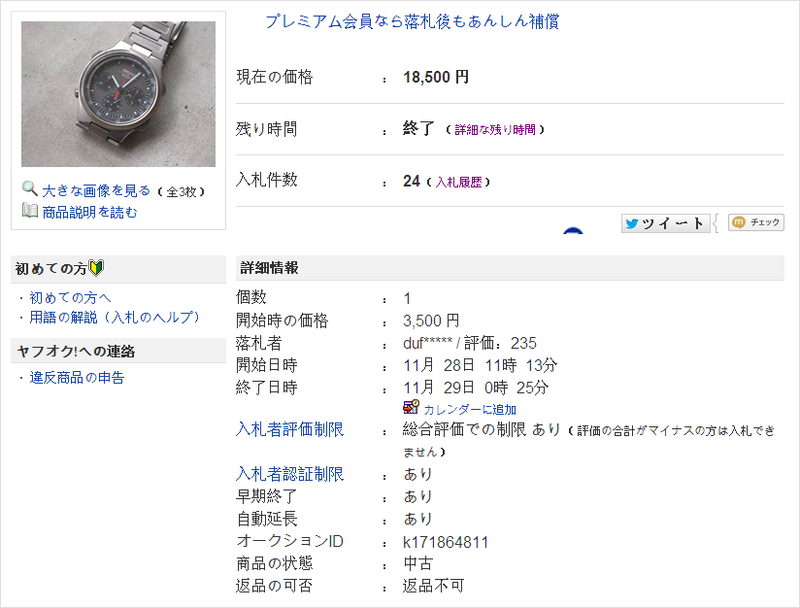 Somebody bagged themselves a bargain 7A38-7030 on Yahoo Japan Auctions this afternoon. 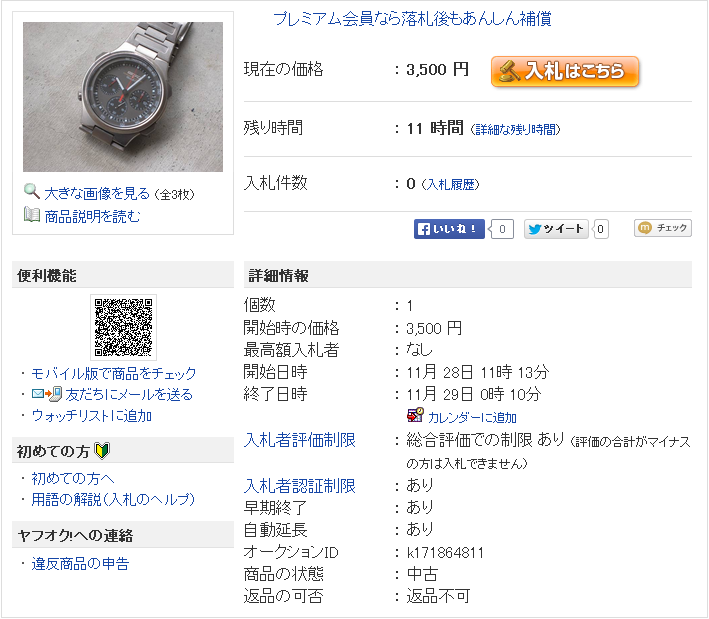 I spotted this listing early this morning - a one-day listing, with an opening bid price of only 3,500 Yen. It is more beautiful decent to state basis. It is running out of battery current. 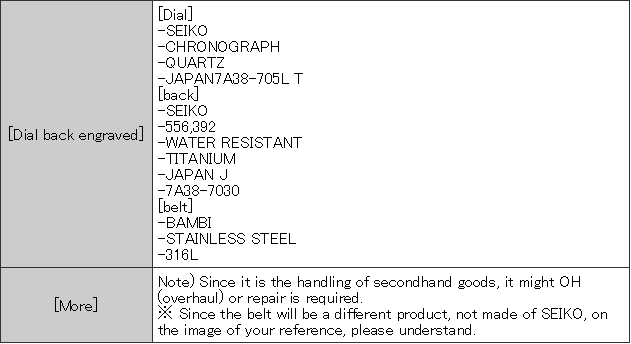 At present, the belt will accommodate up to 16 centimeters. 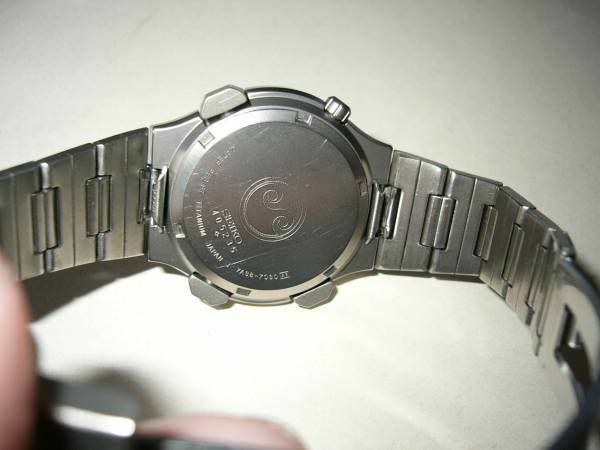 As stated in the very brief description, there were a couple of minor gotchers, in that it was being sold with a run-down battery and if, as the seller wrote, it would (only) fit a 16cm wrist was correct, then it was also very short of bracelet adjustment links. But otherwise it appeared to be in fairly decent cosmetic condition, with the usual fading of the red CHRONOGRAPH dial printing. As closing time drew nearer, bidding was up to 12,500 Yen - then someone bid in the last 5 minutes, so it was extended (twice). A total of 24 bids were placed by six different bidders, before they surprisingly gave up at a mere 18,500 Yen. That's equivalent to just $181 US or £111 GBP. Short bracelet or not - somebody bagged themselves a real bargain ! It's been a while - nearly a year since I last spotted a 7A38-7030. If I hadn't run a quick search on '7A38' on Yahoo Japan auctions this morning, I might have missed this one, because as per the previous example in November last year, again it's only a one-day listing. This is a USED goods, but as the mono back then is the beauty goods. 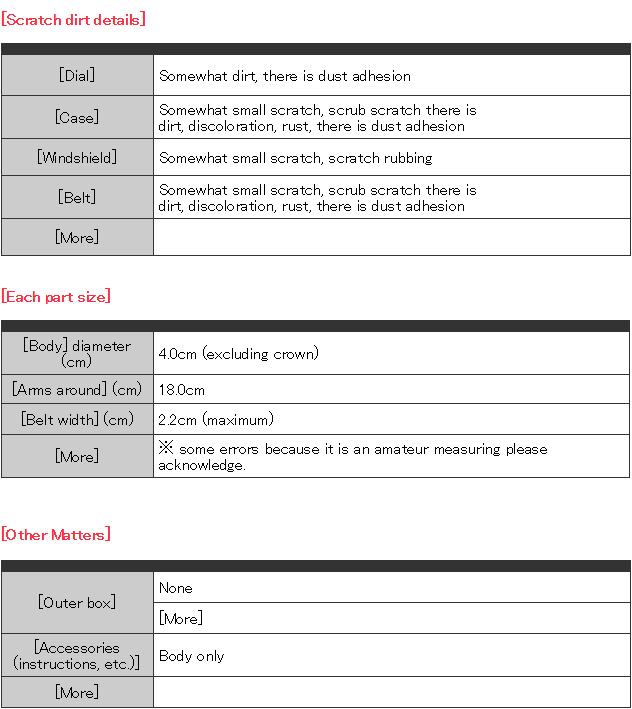 We have collection after OH manufacturer. 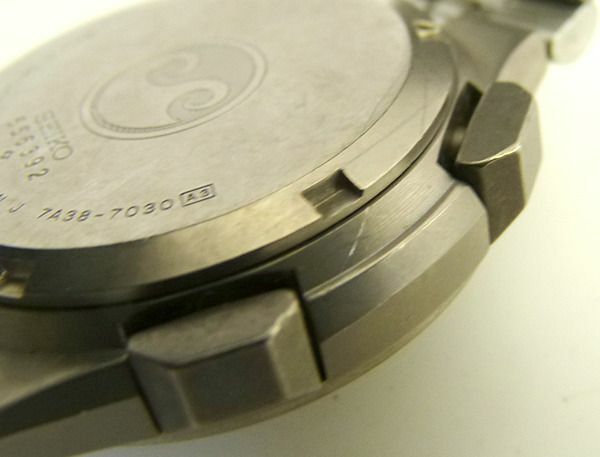 Breath is the clasp to fit in narrow end of the arm at about 17 centimeters and are suffixed to reverse (you fix of course) is a high-end model made ​​of all titanium in 7A system quartz chronograph that has been adopted in the UK military watch. And it's with a calendar. If you were looking for this model! Do you like to take this opportunity! 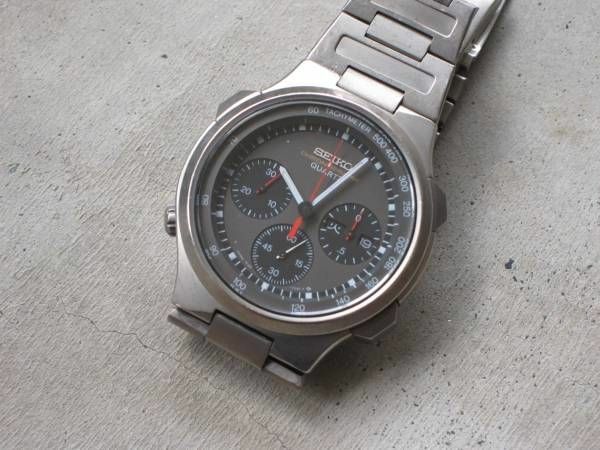 I need your help by you in NC / NR of Seiko mania. 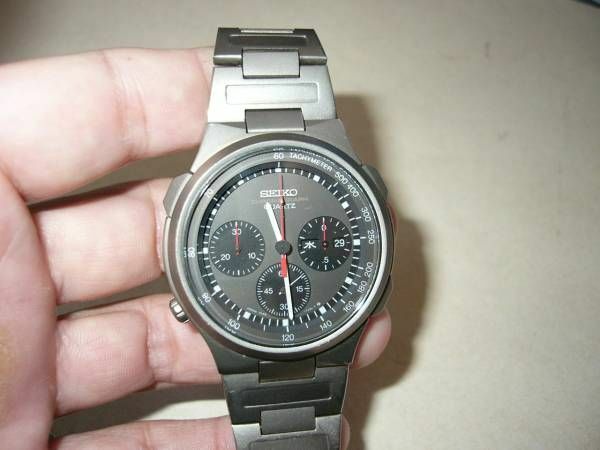 It is made ​​of Suwa Seikosha of 1984. 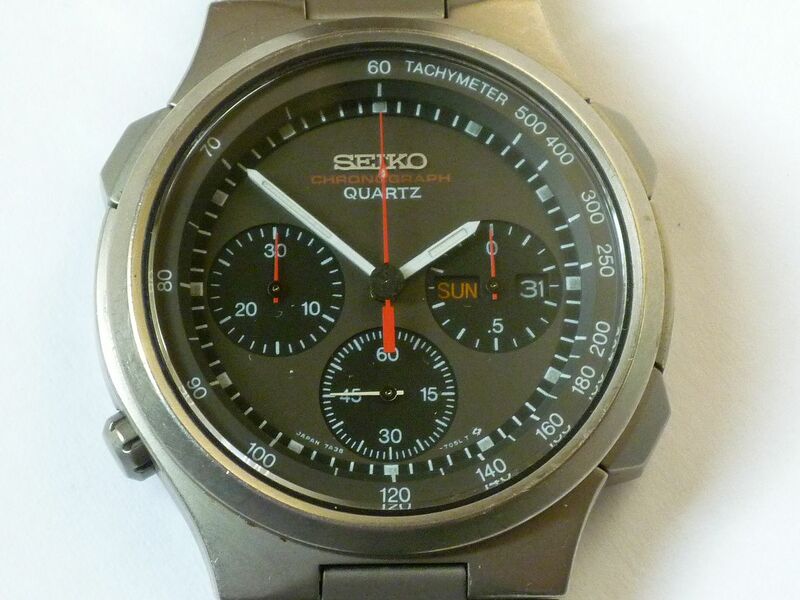 As is common in nearly all used examples, the originally red dial printing of the word CHRONOGRAPH has faded to pale yellow and once again, the bracelet is short (of adjustment links) and will only fit a wrist size of approx 6¾". 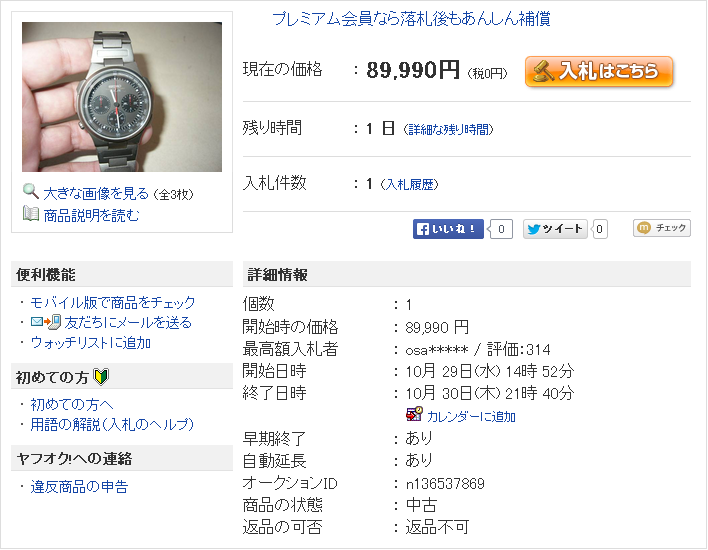 Incredibly with a whopping opening bid price of 89,990 Yen (equivalent to approx. £516.50 GBP / $833 USD) there is actually one bidder ! 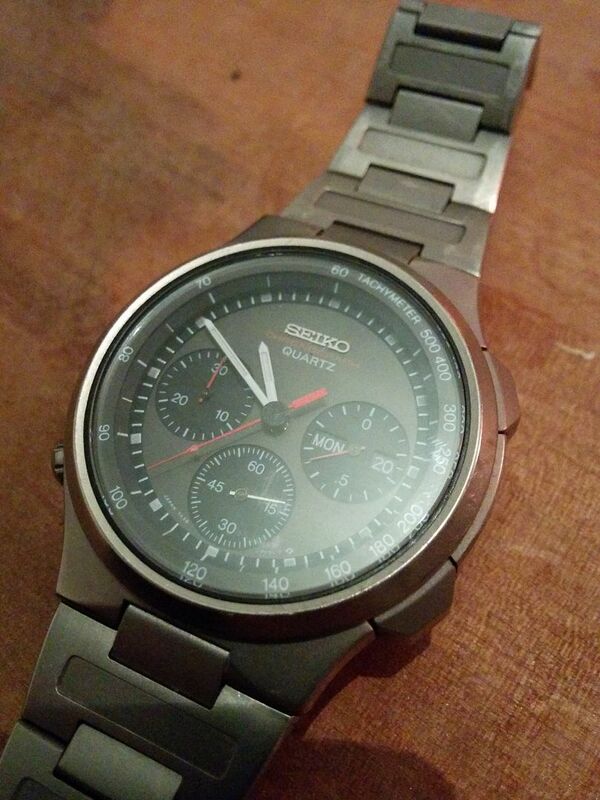 My dad has this watch and I've been looking for replacement links for it for a long time. A couple of his links snapped so can't use original strap at the moment and finding another has proven impossible. Would anyone know were on earth I can get links or a strap for it? Posts edited by Admin (to remove quote and unnecessary duplication of photos). 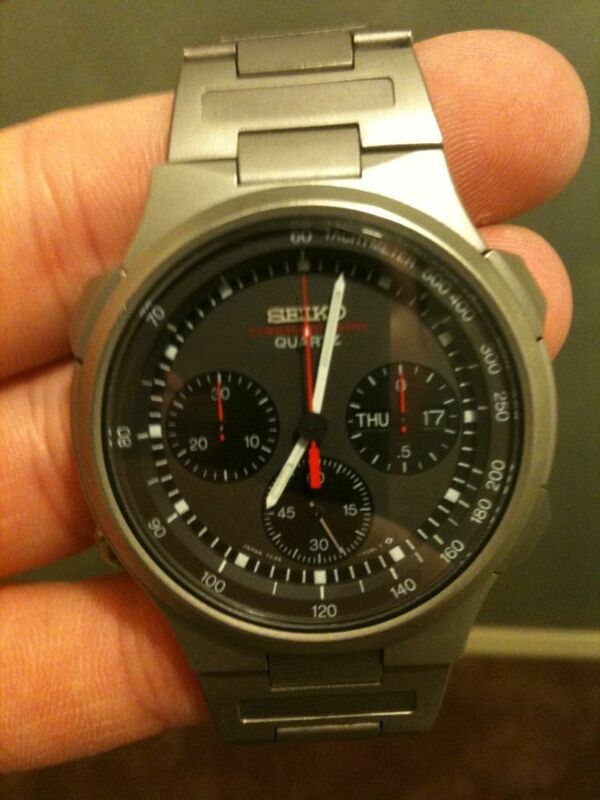 See: http://www.seiko7a38.com/apps/forums/topics/show/7168820 PLEASE - Don't quote me !! 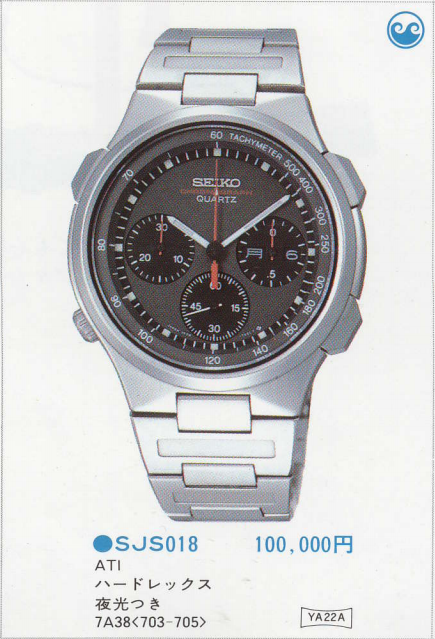 You could try contacting Seiko in Japan (as it's a JDM model), but I wouldn't hold out much hope of success. Obviously you'll need to quote the cal. / case model # 7A38-7030. 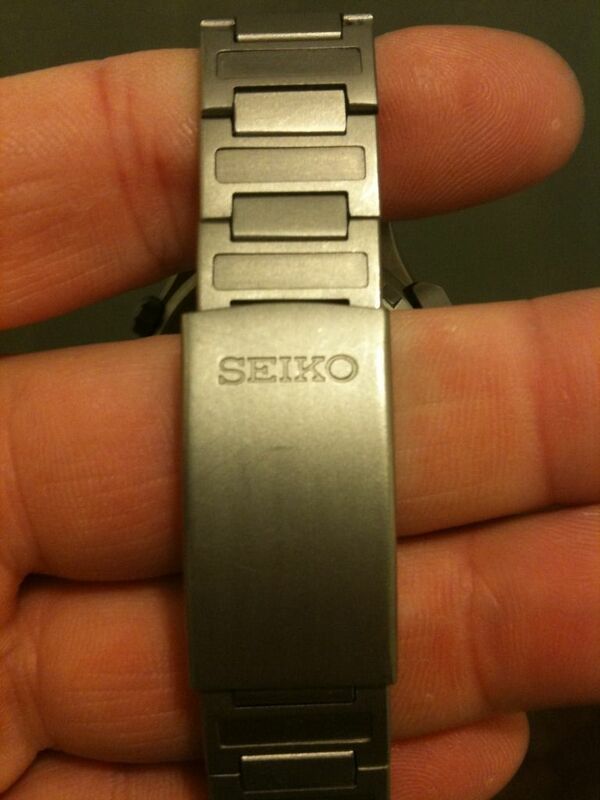 The bracelet is Seiko p/n YA22A. I just picked up nice-condition 7A38-7030. 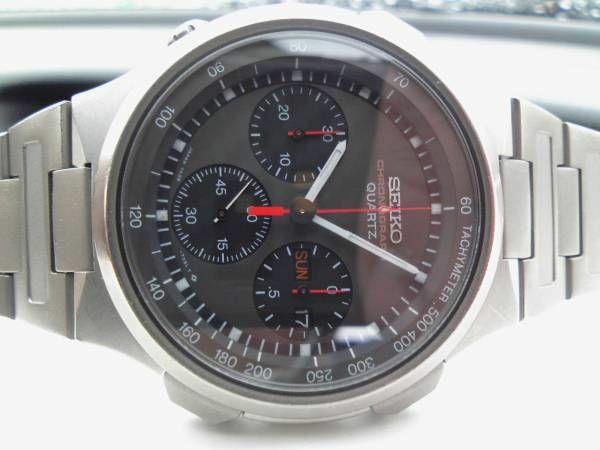 I don't know much about watches in general, but I know I like this one. Not too flashy or big, plus it's nice and light. Oh, and it was made just a few months after me! The bracelet looks to be the original as well. Please excuse the poor photos, my camera is elsewhere at the moment. Not bad I suppose. Seen better - owned worse. 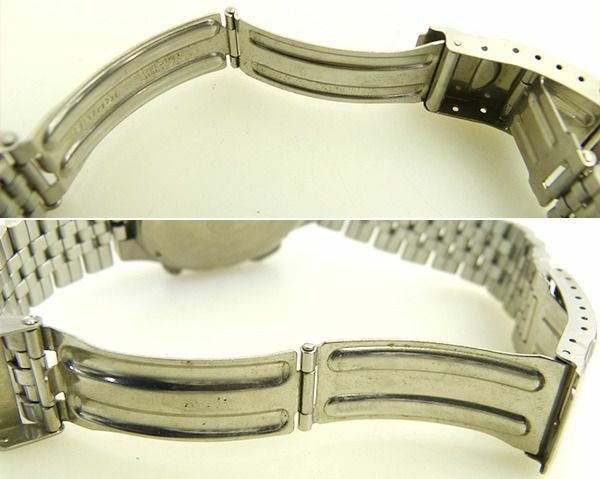 This 7A38-7030, fitted with an ill-matching stainless Jubilee style replacement bracelet, was listed on Yahoo Japan auctions in the early hours of this morning by a YJ Store seller. 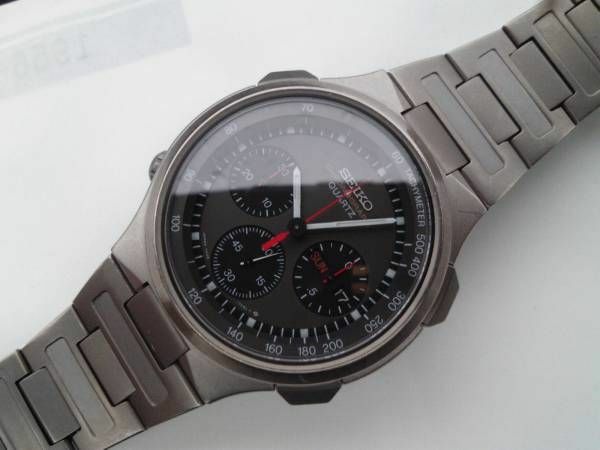 That Yahoo Japan auction for the 7A38-7030 fitted with an ill-matched non-original stainless bracelet ended about half an hour ago. 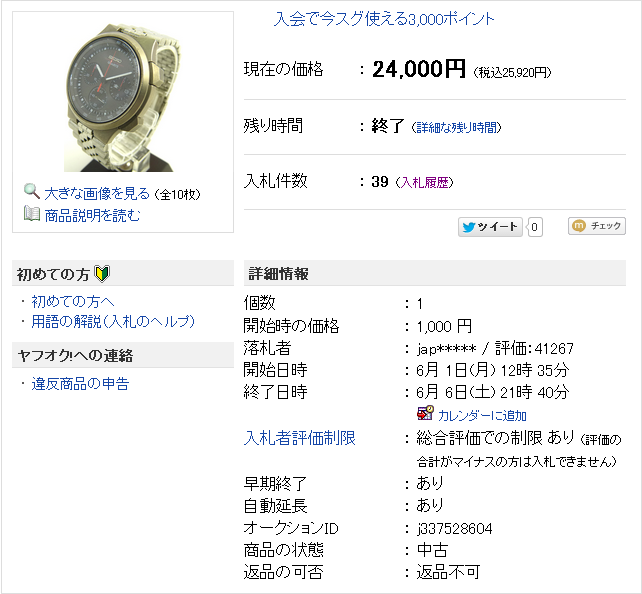 It sold for 24,000 Yen + 8% VAT = 25,920 equivalent to approx. $206.36 USD / £135.15 GPB after 39 bids by 4 different bidders. Going by the (abbreviated) winning ID, it was won by someone outside Japan using the Japamart proxy bidding / shipping service.